Prompted by my friends over at the Liberal Gun Club, this is another in an occasional series of revisiting some of my old articles which had been published elsewhere over the years, perhaps lightly edited or updated with my current thoughts on the topic discussed. This is an article I wrote for Guns.com, and it originally ran 3/6/2012. Images used are from that original article. Some additional observations at the end. “One of us! One of us!” chanted Keith, who stood beside him. “Yeah, OK, I’m curious,” I said, turning the new Glock over in my hand, examining it. The truth is, I was curious. I knew that Glock had changed a number of things about the gun with the introduction of the fourth Generation model (or Gen 4 as they call it), as with the rest of their line. I hadn’t gotten around to trying any of the new guns yet. But my friends knew my bias against Glocks. Oh, I think Glock makes good guns. There’s little doubt of that in my mind. And they’ve had a profound effect on the modern firearms industry. But I just don’t like them. To clarify, I don’t like shooting them. I’m just one of those people for whom the ergonomics of the Glock design doesn’t really work. It always feels like I’m holding a brick and trying to shoot it. They don’t point naturally, they don’t feel right in my hands, and I have a hard time hitting the broad side of a barn with one. A shame, really, since I do think that they’re good guns, incredibly reliable, and they’re reasonably priced with plenty of accessories available. My friends knew this. 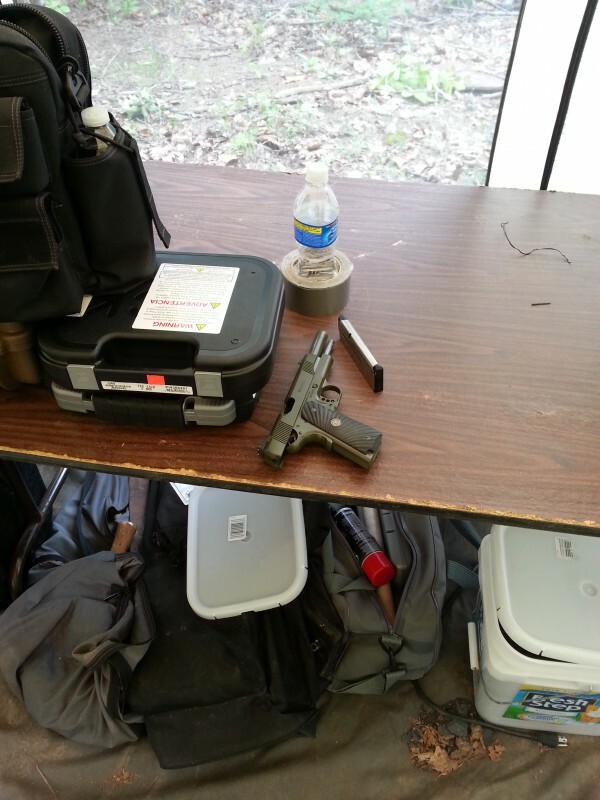 But one of them had just gotten the new Glock 21 Gen 4, and wanted to give it a try. I wanted to see whether the modular back-strap system would change the feel of the gun at all in my hands. The Glock 21 is a full-sized .45 ACP pistol, generally considered to be a ‘duty’ gun. It holds 13 rounds, has a 4.6-inch barrel, a full-sized grip, and weighs 26 ounces. All around, it is a quality gun, though the emphasis is on function rather than looks. The sights are good, the trigger decent, and the fit and finish up to par. You know what you’re going to get from a Glock. Keith (who is a Glock-certified armorer for his police department) took the gun from me, quickly disassembled it while giving me a run-down on the changes of the Gen 4 model: a more aggressive grip texturing, larger (and reversible) magazine release, and the aforementioned back-strap system. Quickly reassembling it, we loaded up magazines and gave it a try. How was it? Well, keep in mind that, as I said, I don’t care for Glocks generally. I have large hands, bigger than either of my friends’. But counter-intuitively, the smallest profile back-strap was the one that felt the best to me. The ergonomics were much the same as the older Glocks I had tried, but for whatever reason it was easier for me to accommodate the shape of the grip with the lower profile back-strap. And yeah, the recoil was mild. Very mild. Even though we shot first target ball ammo, and then full +P self-defense rounds, it felt like my mild practice reloads out of a full-sized 1911. Between the different grip and the recoil, it was easy for me to hit the target with my first shot and with subsequent follow-up shots. Final Thoughts: In Glock We Trust? After I went through a couple of magazines, I could tell that the ergonomics were still not quite right for my hand – the recoil did tend to focus on an odd place at the base of my thumb. But for the first time I could actually see myself owning one of these guns. I’m going to have to give some of the other Gen 4 models a try, see if they offer the same (or similar) shooting experience. I don’t mind having to change my mind about me and Glocks. Don’t mind at all. Well, I *did* get a G21 Gen4, and did a .460 Rowland conversion on it (more on that next time). And since then I’ve also added a G30S (which is also a .45) to my collection. So clearly I’ve decided that the Gen 4 Glocks are indeed suitable for me. As I said above: they’re good guns. I don’t consider myself to be a ‘Glock Fanboy’, but I don’t hesitate to recommend them to people … with the caveat that you should *always* try shooting a gun (on multiple occasions, if possible) before buying. Even with a Gen 4 Glock. Prompted by my friends over at the Liberal Gun Club, this is another in an occasional series of revisiting some of my old articles which had been published elsewhere over the years, perhaps lightly edited or updated with my current thoughts on the topic discussed. This is an article I wrote for Guns.com, and it originally ran 3/8/2012. Some additional observations at the end. OK, we’re all adults here. I think that the time has come to talk about something a little filthy, something that has plagued shooters for decades and something we need to put a stop to, for the good of all of us gun owners. The time has come to clean up our act and get rid of all of our dirty magazines. No, not *that* kind of dirty magazine (jeez – get your mind out of the gutter!). I’m talking about the kind of magazine that goes into your firearm. Sheesh. Now, be honest: when was the last time you inspected and cleaned out your magazines? I mean took them apart and cleaned them thoroughly inside and out? Examined the parts for unusual wear? And then lubed ‘em properly with gun lube before putting them back together? Seriously, this is one of those details that a lot of people just never think about: that to function properly, a semi-auto firearm (or a select-fire one, for that matter) needs a working magazine and while the magazine is usually a pretty simple component of a pistol, it too needs to be cleaned and maintained regularly (just like any other mechanical component of your gun). Otherwise it can impede smooth functioning of your firearm, and that can lead to very bad things called “weapons malfunctions” and “failures to feed”. Which can lead to the dreaded “oops, I’m dead” problem in a self-defense situation. Happily, almost all modern handguns magazines have been designed so that the average person can disassemble and then easily reassemble them, though over the years I have known plenty of people who either didn’t know this or didn’t care (or really just forget to check/clean their magazines regularly). Body – this is the overall housing. Spring – the internal part that pushes cartridges up into the pistol. Follower – a small metal or plastic plate on top of the spring which guides cartridges. Floor plate – the bit at the bottom of the body that holds the spring and follower in place. One other part I want to mention, though it is not a ‘component’ is the (feed) lips. 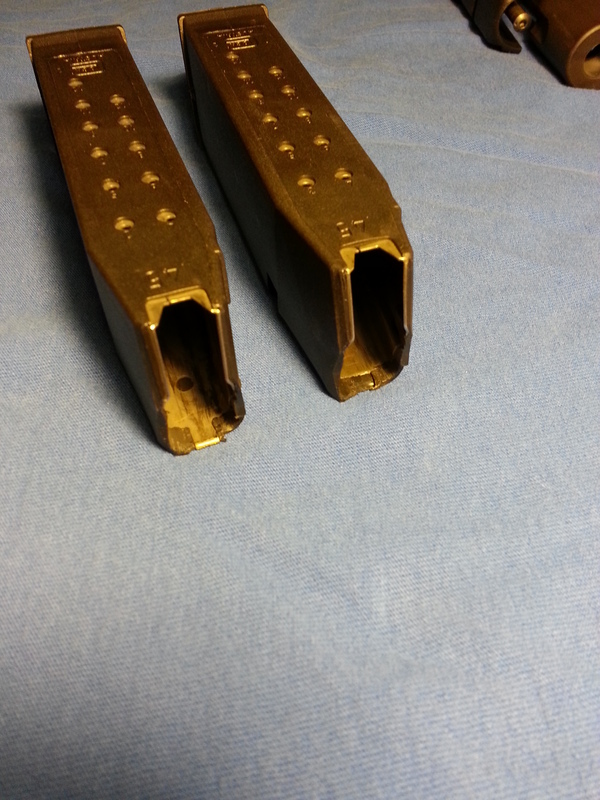 This is the upper part of the magazine body that helps to position cartridges properly within the pistol so that they can be transferred from the magazine into the chamber of the gun. Sometimes these can become pinched, which could lead to failure to feed. Remove all the cartridges from your magazine. 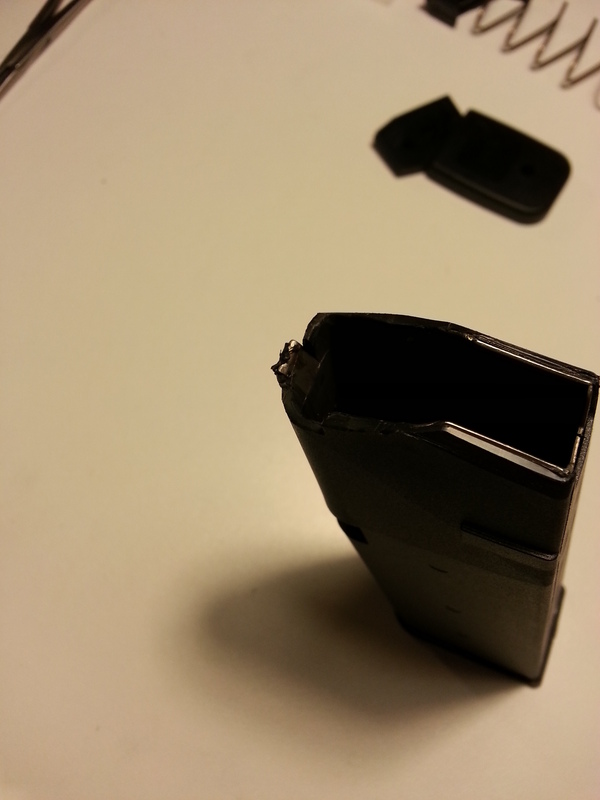 Examine the magazine, looking for obvious wearing or breakage (rare, but it happens). Look at the floor plate. There should be some variety of clip or clasp that keeps it in place and it might need a small part to be moved, or a little spring latch tripped (usually with a small rod or nail). Slide off the bottom of the body once you remove the floor plate. Be careful when doing this, since the spring inside the magazine will be under some pressure and may want to shoot out (finding this smaller piece once its been lost can be a challenge too). Take out the spring and follower from the bottom of the magazine. The follower may be mounted to the top of the spring, or it may be free and just held in place by spring tension. Try to pay attention to this as you remove the spring. Clean the inside of the body thoroughly, using your usual gun cleaners and tools. Look at the top of the body, where the lips are. Make sure that these are cleaned inside and out as well. Examine the spring, checking for built-up dirt or rust. Wipe down with a rag & some cleaner, then lubricate lightly. Do the same for the follower and floor plate. Now you’re ready to reassemble the magazine. Just reverse the steps for taking it apart, being careful that the follower and spring go in correctly (this matters on many, but not all, magazines). Hold the spring in place and snap the floor plate back into position. 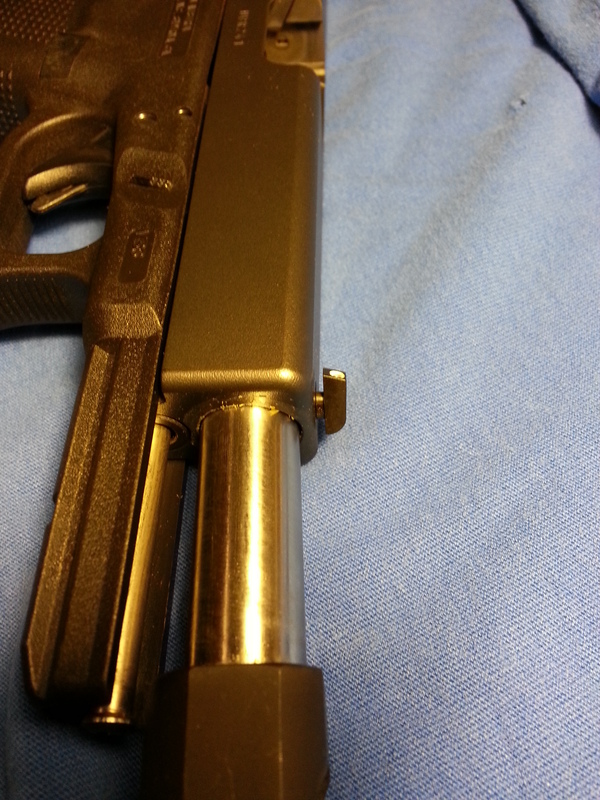 Check the magazine to make sure that the follower moves freely when under pressure, and that the empty magazine fits back into the gun properly, and locks into place. Now you’re ready to use it again. There are two additional items I want to mention. One, and this is a discussion that comes up frequently in firearms forums, is whether you will hurt the springs in a magazine by leaving the magazine full of ammunition. Everything I know about springs, and every engineer I’ve ever talked with about this, both say “no.” It should be perfectly safe to load a magazine fully, put it into proper storage, and then leave it for years without causing a problem. And two, I no longer “top off” my magazines. “Topping off” is where you fill a magazine, place it into a pistol, then chamber a round, and then remove the magazine and place another cartridge into the magazine before replacing it. You’ll see a lot of people refer to a given gun as “10 + 1″ or “14 + 1″. This is what they mean, and it is tempting to do in order to have an extra cartridge. I used to do this regularly and usually I didn’t have any problems with my various pistols when I did. But every once in a while I’d get a failure of a gun to cycle properly after the first shot. I discussed it with friends, and one buddy who is an armorer for a SWAT team said that he’d stopped “topping off” for his department, and that it eliminated these rare but occasional problems. His theory was that the additional pressure of a completely full magazine on the underside of the bolt/slide operating mechanism slowed it down just enough to mess up the timing of the gun when it was fired, and so presented a problem. Since I’ve adopted the practice of regularly cleaning my gun and filling my magazine only to capacity, I haven’t had any feeding problems and, if only for my own peace of mind, I’ve just made it my routine. Personally, I’d much rather have a gun which will reliably shoot the second round than have ‘one extra’ round in the mag. Your preference, like your mileage, may vary. I don’t take apart and clean my magazines after every trip to the range. But I try to remember to do it after a couple of trips, and that seems sufficient. I have also learned the wisdom of cleaning *new* mags when I first get them (or when I buy a new firearm) — they’re often surprisingly dirty, and on a couple of occasions I have found mild corrosion on either the spring or inside the body of the magazine, because they had been stored in improper conditions or there was a minor problem with their manufacturing process. So, it doesn’t hurt to check. Velocity is great, but mass penetrates. OK, kiddies, it’s time for SCIENCE! Ballistic science, specifically. I promise to keep the math to a minimum, because I don’t like it much, either. Jim Kasper is the one who thinks in terms of equations, not me. The kinetic energy is equal to 1/2 the product of the mass and the square of the speed. In other words, you multiply the weight of the bullet times the square of the velocity, then take half of whatever number you get. And that gives you the Muzzle Energy, usually (as on our site) expressed in foot-pounds of energy. So there are two ways you can change the result: change the amount of weight, or change the amount of velocity. But since it is the square of the velocity (the velocity times itself), changes to the velocity have a larger impact on the final amount of Muzzle Energy. That’s the reason why how the velocity changes due to barrel length is such a big deal, and why we’ve done all the research that we’ve done over the last seven years. But while Muzzle Energy gives you a good way to compare the power and potential effectiveness of a given cartridge as a self-defense round, there are a couple of other factors to consider. A couple of VERY important factors. Designing a bullet for efficient transfer of energy to a particular target is not straightforward, for targets differ. To penetrate the thick hide and tough bone of an elephant, the bullet must be pointed, of small diameter, and durable enough to resist disintegration. However, such a bullet would penetrate most human tissues like a spear, doing little more damage than a knife wound. A bullet designed to damage human tissues would need some sort of “brakes” so that all the KE was transmitted to the target. It is easier to design features that aid deceleration of a larger, slower moving bullet in tissues than a small, high velocity bullet. Such measures include shape modifications like round (round nose), flattened (wadcutter), or cupped (hollowpoint) bullet nose. Round nose bullets provide the least braking, are usually jacketed, and are useful mostly in low velocity handguns. The wadcutter design provides the most braking from shape alone, is not jacketed, and is used in low velocity handguns (often for target practice). A semi-wadcutter design is intermediate between the round nose and wadcutter and is useful at medium velocity. Hollowpoint bullet design facilitates turning the bullet “inside out” and flattening the front, referred to as “expansion.” Expansion reliably occurs only at velocities exceeding 1200 fps, so is suited only to the highest velocity handguns. Now, while that last bit about needing to exceed 1200 fps may have been true, or a ‘good enough’ approximation a few years ago, it isn’t entirely true today. There has been a significant improvement in bullet design in the last two decades (and these innovations continue at a rapid pace), so that there are now plenty of handgun loads available which will reliably expand as intended in the velocity range expected from the round. According to Dr. Martin Fackler and the International Wound Ballistics Association (IWBA), between 12.5 and 14 inches (318 and 356 mm) of penetration in calibrated tissue simulant is optimal performance for a bullet which is meant to be used defensively, against a human adversary. They also believe that penetration is one of the most important factors when choosing a bullet (and that the number one factor is shot placement). If the bullet penetrates less than their guidelines, it is inadequate, and if it penetrates more, it is still satisfactory though not optimal. The FBI’s penetration requirement is very similar at 12 to 18 inches (305 to 457 mm). A penetration depth of 12.5 to 14 inches (318 and 356 mm) may seem excessive, but a bullet sheds velocity—and crushes a narrower hole—as it penetrates deeper, while losing velocity, so the bullet might be crushing a very small amount of tissue (simulating an “ice pick” injury) during its last two or three inches of travel, giving only between 9.5 and 12 inches of effective wide-area penetration. As noted above, the design of the bullet can have a substantial effect on how well it penetrates. But another big factor is the weight, or mass, of the bullet relative to its cross-section — this is called ‘sectional density‘. Simply put, a bullet with a large cross-section and high mass will penetrate more than a bullet with the same cross-section but low mass moving at the same speed. It isn’t penetration, but think of how hard a baseball hits versus a whiffleball moving at the same speed. They’re basically the same size, but the mass is what makes a big difference. (See also ‘ballistic coefficient‘). OK, let’s go all the way back up to the top where I discussed Muzzle Energy. See the equation? Right. Let’s use the baseball/whiffleball analogy again. Let’s say that the baseball weighs 5.0 ounces, which is 2,187.5 grains. And the whiffleball weighs 2/3 of an ounce, or 291.8 grains. A pitcher can throw either ball at say 60 mph, which is 88 fps. That means (using this calculator) that the Kinetic Energy of a baseball when it leaves the pitcher’s hand is 37 foot-pounds, and the whiffleball is just 5 foot-pounds. Got that? But let’s say that because it is so light, the pitcher can throw the wiffleball twice as fast as he can throw a baseball. That now boosts the Kinetic Energy of the whiffleball to 20 foot-pounds. And if you triple the velocity of the whiffleball? That gives it a Kinetic Energy of 45 foot-pounds. Yeah, more than the baseball traveling at 88 fps. What is the top line on that graph? Yeah, Liberty Civil Defense +P 78 gr JHP. It has almost 861 foot-pounds of energy, which is more than any other round included in those tests. By the Muzzle Energy measure, this is clearly the superior round. But would it penetrate enough? Maybe. Brass Fetcher doesn’t list the Liberty Civil Defense +P 78 gr JHP. But they did test a 90 gr RBCD round, which penetrated to 12.0″ and only expanded by 0.269 square inch. Compare that to the other bullets listed on his page, and you’ll see that while the depth of penetration isn’t too bad when compared to other, heavier, bullets, that round is tied with one other for the least amount of expansion. Driving a lightweight bullet much, much faster makes the Muzzle Energy look very impressive. Just the velocity of the Liberty Civil Defense +P 78 gr JHP is impressive — 1865 fps out of a 5″ barrel is at least 50% faster than any other round on our test results page, and almost 400 fps faster than even the hottest of the .45 Super loads tested. Personally, I prefer a heavier bullet. Ideally, I want one which is also going to have a fair amount of velocity behind it (which is why I have adapted my .45s to handle the .45 Super). All things being equal (sectional density, bullet configuration and composition), velocity is great, but mass is what penetrates. So, early this year I put in an order for a .460 Rowland conversion kit for a new Gen 4 Glock 21. I’m planning on doing a full formal review of the kit and the resultant gun, but I thought I’d share some of my experience so far. Why “so far”? Well, because I haven’t worked out all the minor kinks yet. OK, first thing: it didn’t just take the 3 weeks for delivery which was promised. It wasn’t even 3 months. It was almost six months. And a buddy of mine who ordered his before I ordered mine still hasn’t gotten his. So, there’s that. 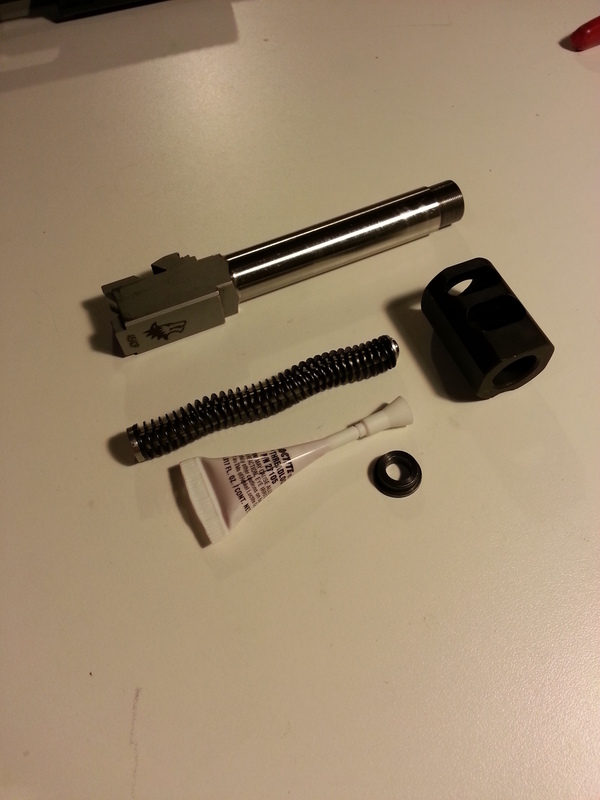 Going clockwise from the top: That’s the threaded barrel, a screw-on compensator, spring assembly adapter, small serving of red loc-tite, and the heavy spring assembly (which is actually the Gen 3 design, but with the adapter works just fine in my Gen 4). As advertised by .460 Rowland, the conversion takes like 30 seconds. 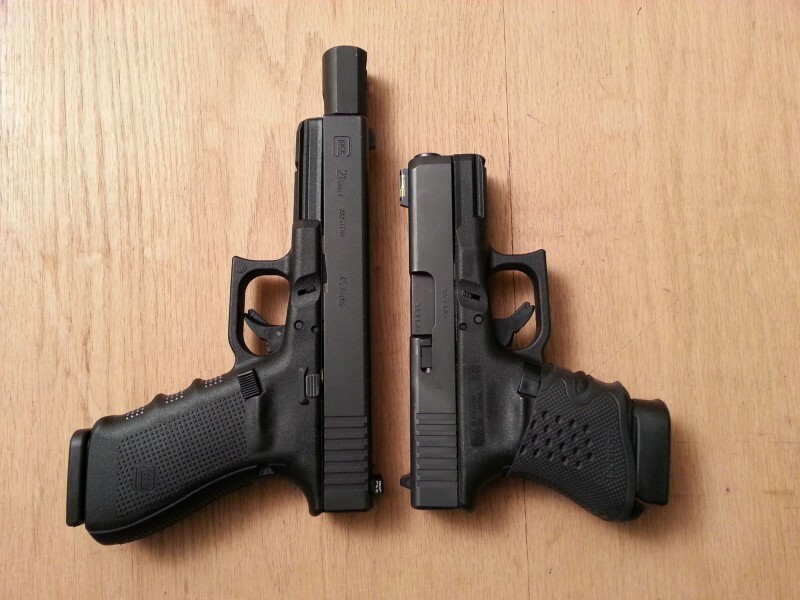 If you can field strip your Glock, you can do the conversion. I’ve opted for using blue loc-tite rather than red, since it still works well but allows me to remove the compensator easily if I need to. Shooting the .460 loads out of the Glock is like shooting a .44 magnum (which I have a fair amount of practice with), but having 13 rounds on tap. Seriously, it’s like flinging thunderbolts with each shot. And the recoil is surprisingly manageable, though I’m not someone who is very recoil shy. So, why did I say I was still working out the kinks? Look closely on the left side of that magazine, and you’ll see that there’s a tab which has been torn a bit loose and pushed forward. That’s from the force of the .460 cartridges slamming forward. At about this point the magazine would no longer release or insert smoothly. 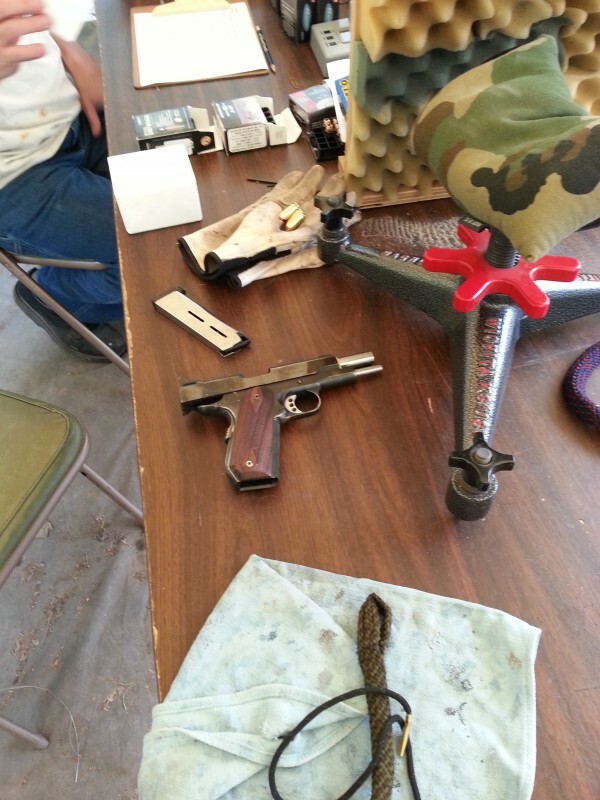 That was after my first outing, with about 60 .460 Rowland shots fired. And actually, I damaged two magazines to that extent with those 60 rounds. More problems. This time, the little metal tab snapped off, as well as distorting the face of magazine again. Clearly, I need to sort out how to fix this. Two other things I want to mention. 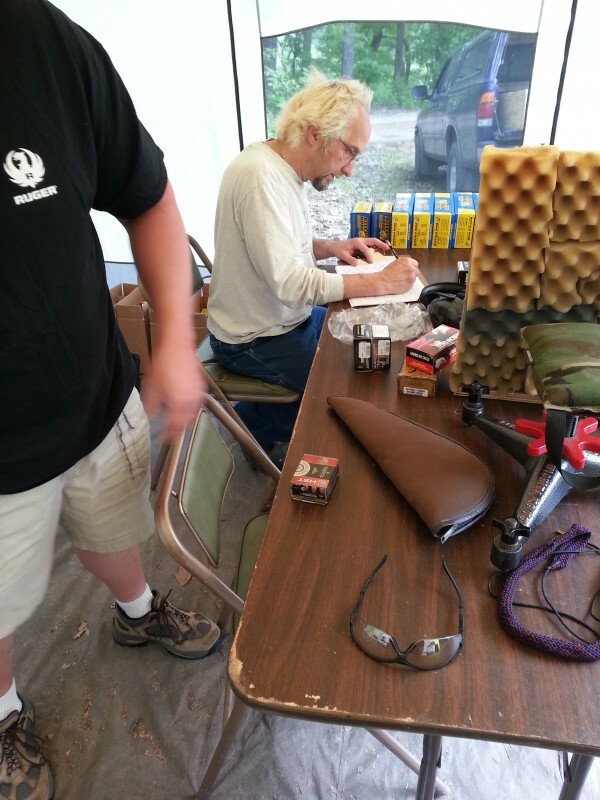 One, I tried shooting standard .45ACP cartridges out of the .460 Rowland conversion. They work wonderfully. Seriously, there’s almost no recoil, the gun cycles just fine (with my mild reloads as well as factory +P self defense ammo), and there’s no accuracy loss that I could determine casually shooting the gun. So, that’s a plus. Yeah, it really shouldn’t be facing that way, nor sticking up quite so much. But I can fix that easily enough. If you have thoughts on how I can correct the magazine problem, I’d love to hear ’em.